I’m running way behind on Garden Tribe’s 21-Day Veggie Garden Boot Camp, so I’ll try to catch up the next few days. Day 8 topic is Raised Beds–a subject dear to my heart, because I think you can make a garden look really stunning by adding different levels. 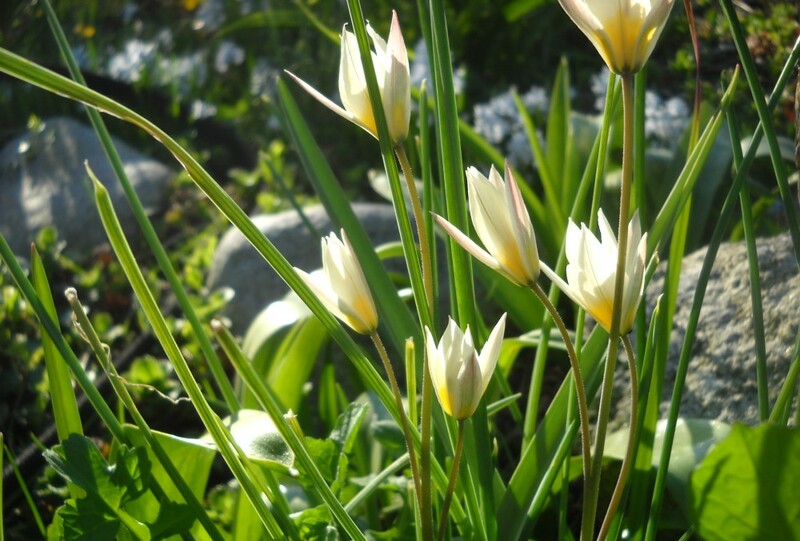 Of course, beauty is not necessarily the point for Garden Tribe. Let’s just stick to the basics, “Just the facts ma’am, just the facts”. Why do you want a raised bed? You have no ground space or your only available ground space is inappropriate for vegetables. Your need the physical convenience of raised bed. Impervious concrete/asphalt/other. Walls of raised bed need to be taller than if located over soil; needs to have a bottom with landscape cloth and good drainage. Grass/turf/weeds that you’re going to cover and smother. In my experience it took at least a year for the plant material to decompose, and in the meantime was full of wireworm that got into the potatoes. Soil that’s difficult to till/grow in/doesn’t drain well. Covering that over with lots of inches of largely organic mixture will begin the process of amending that soil, so it’s a very good thing. Reasonably good growing soil, just not high enough. So you’re going to make it higher. How high to the raised beds need to be? If you look at the link above to Easrtheasy.com you’ll see how deep the roots grow for various vegetables. Even tho’ the roots prefer to grow that deep, doesn’t mean the have to grow that deep. Just remember that, depending on what’s underneath the raised bed, you may be responsible for the entire reservoir of nutrients, water and growing medium (see container growing Day 7). 5 Gallon cloth containers. These dry out FAST. 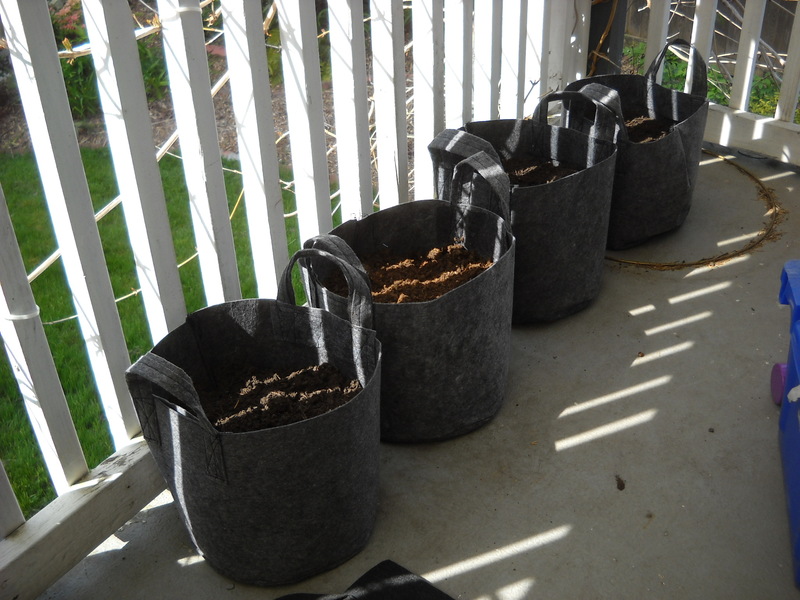 These 5 gallon containers (allegedly a tomato plant needs to be in at least 5 gal pot) are only about 12″ tall. I did get tomatoes last year, but not as many as I should have. So taller is better. Besides that, you’re going to be growing different things in different place in years to come (I’m sure more of that to come in future GT days), so you may not need too much depth this year for lettuce, but next year you may be growing squash or parsnips or carrots in that spot. Never mind, on with Day 3–Where to Plant. My motivation as a designer is always to give people the tools to be proud of their labours. That inspires us to do more of the same. So what will it take to be proud of our vegetable garden? Making it as easy as possible, so you’re keen to get started, keep at it, see progress, get quick results, and finally, succeed! This is not an example of quick results (nor “success” as one would usually define it). I sowed asparagus seeds indoors spring 2013; few of them survived the transplant, so I direct sowed some more. 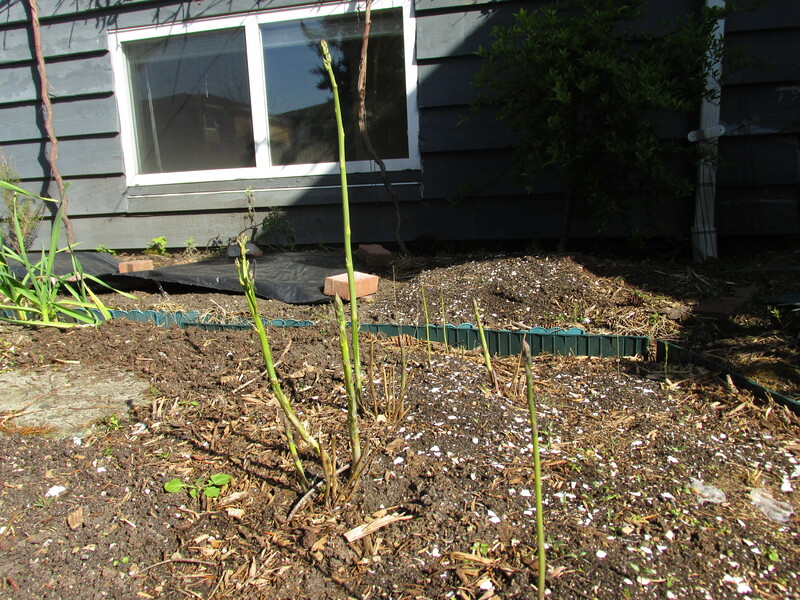 Two years later this is my asparagus bed. 1. How much space do you think you’ll need? If you haven’t done a lot of gardening before, don’t bite off more than you can chew (someone please give me a non-food metaphor!). Did you identify 25 vegetables you know you’ll eat? Short list 5 of them. The you can devote yourself to those five and really give them the best of your energies. 2. Now, what will the actual garden beds look like? 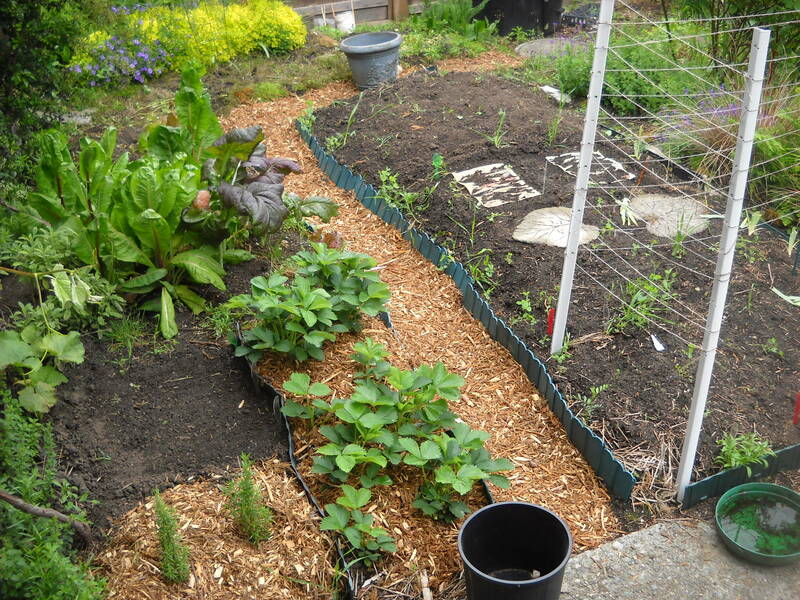 If you want to plant up a bed that’s 10′ x 10′, you’ll have to build paths through it, thus losing planting space anyway. Better for the home garden to have beds that are no wider than you can reach. For me that’s 3′. I can reach 18″, and I have access on two sides, therefore a 3′ wide bed. If I plant veggies along the edge of a perennial or shrub border (I’m sure Garden Tribe will address that in future days), then I won’t go deeper into the bed than 18″–as far as I can comfortably reach. 3. Light. Usually you can expect to find vegetable gardens located in full sun. Here in coastal BC, even full sun isn’t strong sun, so you seldom have to worry about leaves burning by scorching rays. But the “at least 6 hours of direct sun” rule was meant to be broken. If you get direct sun for the middle 4 hours of the day (say 11 am to 3 pm, that will be as much real light (lumens?) as 6 hours 7 am to 1 pm. So for fruits and roots, definitely give them the most direct sunlight you can, but if there’s competition for the very few square feet of the only really sunny spot you’ve got, try out less sunny spots for some of them and odds are you will still get some harvest. Potatoes for example are meant to like full sun, but I’ve recently read they’ll tolerate less than the best and still give you potatoes. Tomatoes on the other hand I wouldn’t mess with. They have a hard enough time ripening in our climate as it is without challenging them even further. Don’t rule out your front yard for growing edibles. 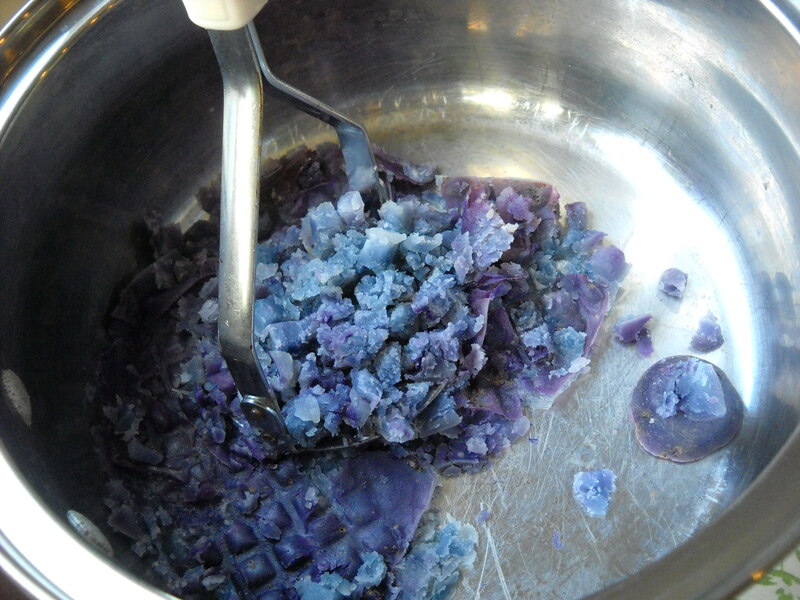 Many are really attractive at their best–like rhubarb, blueberries, many cabbages, swiss chard. 4. Access–to water and to the kitchen. I hate going out to pick kale leaves in the pouring rain, but if at least I don’t have to tramp through a lot of wet grass to get there, I’m more likely to actually do it. So anything that I expect to be harvesting during bad weather will be located closer to the back door. Or front door. 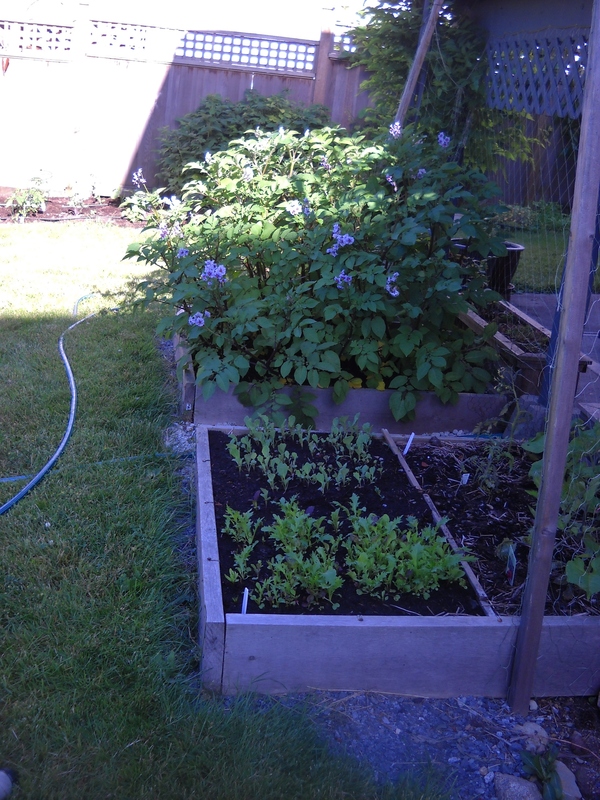 You’ll also want to make sure water is close at hand (will Boot Camp be discussing drip irrigation I wonder?). Harvested my first new potatoes today. 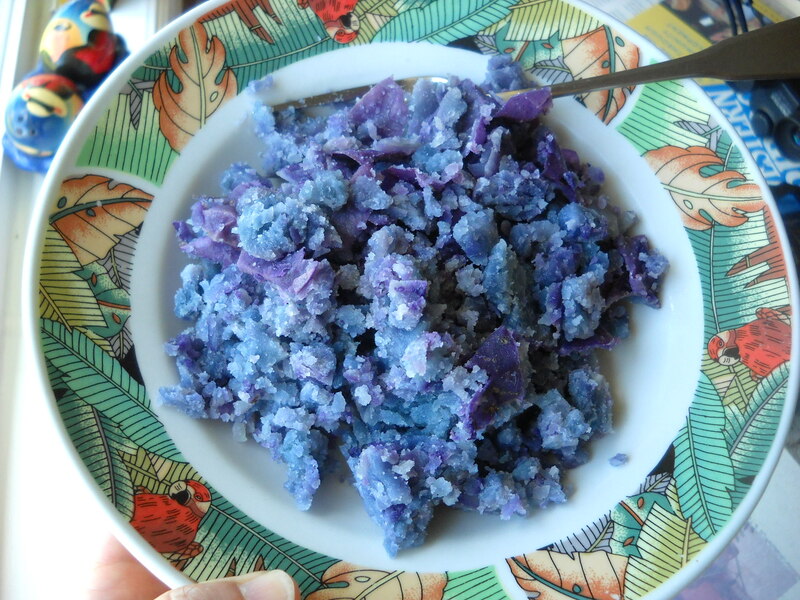 Is it criminal to mash “new potatoes”? And yes, they really are this blue. Russian Blues I think.